New Jersey Personal Injury Law Firm Scholarship will provide provide educational assistance to those affected by personal injury. This scholarship is intended to provide educational assistance to those individuals whose lives have been affected by such accidents, to aid in the difficult effort of rebuilding. As part of its community efforts to support the community of those New Jersey residents who have been affected by personal injury, the law firm of Mazie Slater Katz & Freeman has announced the creation of the annual Legal Studies Education Scholarship. This $2,500 scholarship will be awarded for the first time in 2015, and is being offered to those pursuing a career in legal studies who have been affected in some way by personal injury, and are committed to demonstrating determination to rebuild their lives and the lives around them. In order to be eligible for the 2015 Legal Studies Scholarship prize of $2,500, applicants must be residents of New Jersey; must have been affected in some way by personal injury (either themselves or to a family member); must be currently enrolled, have applied or have been accepted to an accredited college or law school; and must demonstrate academic achievement, reflected by a minimum GPA of 3.5 in either high school or undergraduate transcripts. To apply, students must submit a 500-word typed essay regarding their experience with personal injury, an official high school or college transcript, and their contact information to the office of Mazie Slater Katz & Freeman at: 103 Eisenhower Parkway 2nd Floor, Roseland, NJ 07068, United States. 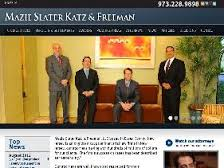 Mazie Slater Katz & Freeman, LLC based in Essex County, New Jersey concentrates in personal injury, medical malpractice, class actions, wrongful death cases, traumatic brain injuries, defective products, birth injury cases, Lasik eye malpractice, workplace accidents, transvaginal mesh litigation, automobile accidents, defective medical devices, and other accident and injury cases.